An exploratory whitepaper dropped yesterday lays out a framework that the FDA hopes to present in a future draft guidance. FDA Commissioner Dr. Scott Gottlieb may be stepping down, but he isn’t slowing down on his way out the door. Yesterday the agency dropped a 20-page exploratory whitepaper on how it could address artificial intelligence and machine learning algorithms. 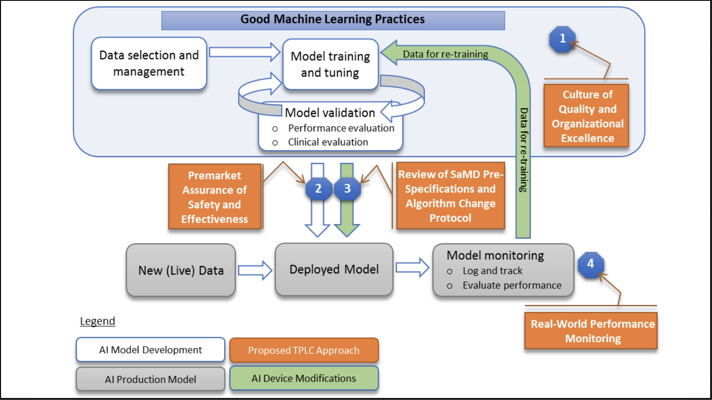 The problem with FDA’s existing methods, as they pertain to AI, is that they are ill-equipped to handle algorithms that constantly learn and self-improve, since FDA generally requires manufacturers to resubmit clearance when major modifications are made to software. As such, the proposed new framework would allow companies to include in their premarket submissions for AI products their plans for anticipated modifications. This includes what the agency has dubbed “SaMD Pre-Specifications” (SPS) and “algorithm change protocol” (ACP). The SPS lays out the sorts of changes the company anticipates making, while the ACP details the processes they will follow to make those changes. Certain changes, like improvements in performance and changes in data inputs, would not require a new submission, but others, like significant changes to intended use, would. FDA gives the example of a physician-facing mobile app for examining skin legions, which collects data from users and uses it to improve the algorithm. The company would not need to seek new approval for the gradual improvement of the algorithm, nor to make the app compatible with additional smartphone cameras. But if they used the algorithm in a patient-facing app, that would require a new clearance. The whitepaper is not a draft guidance, and the FDA is seeking comments on it before moving further. The industry has been asking for this kind of guidance for a long time. Epstein Becker Green partner and CDS Coalition chairman Bradley Merrill Thompson penned a piece on the topic for MobiHealthNews nearly two years ago raising some of these same concerns. Dr. Eric Topol, who recently published a book, “Deep Medicine,” about AI in healthcare, was also supportive of the move from the agency. FDA has been approving AI algorithms for a while now (we rounded up 12 examples last fall). But so far these algorithms have been limited in their ability to learn. Gottlieb explained in his statement. This clearance could open the door for another kind of algorithm. This isn’t coming out of left field — Gottlieb alluded to this guidance last year at Health Datapalooza in Washington, D.C.